Surface or direct contact feed heaters, play an important part in the recovery of latent heat from exhaust steam. Direct contact feed heaters are also known as de-aerators. Surface feed heaters : These are shell and tube heat exchangers, made with materials and scantlings appropriate to their working temperatures and pressures. It can be shown that the minimum economic terminal difference (i.e. the temperature difference between the heating fluid inlet and the heated fluid outlet) is about 6 deg C If, however, the heating fluid (steam) is superheated by at least 110 deg C above saturation temperature and the heated fluid (feed water) leaves the heater at this saturation temperature or near to it, this terminal difference will be very small or zero. This can be achieved by using the exit section of the feed heater as a de-superheater. By grouping a number of surface feed heaters in one module, an economy in space and pipe connections can often be achieved and there is a movement in that direction in practice. Many parts of the feed system are now installed as packaged units or modules. Figure 1 shows a package arrangement which combines no less than four different units, viz. 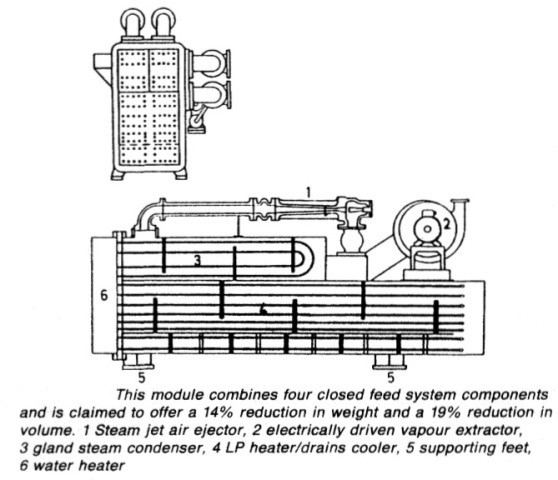 steam jet air ejectors, glands steam condenser, the de-aerator vent condenser and the low pressure heater drains cooler. Such packaging obviously leads to compactness, centralization and reduction of branches to be connected by the shipbuilder. 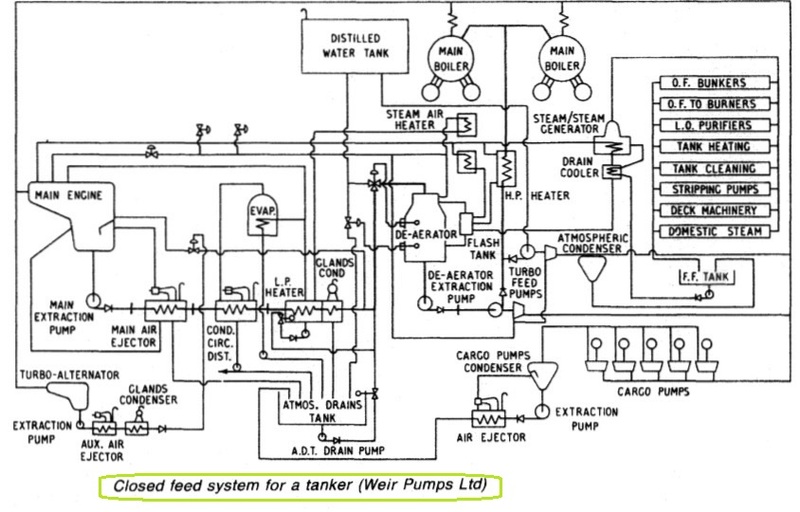 Other 'packaged' feed systems incorporate complete feed systems and Figure 2 shows an arrangement of a packaged feed system for a 67000 tonne tanker.